27 Feb Land of the 47th Most Free and Home of the Weak? Did that headline sink in? Yup. It was announced this week that America now has the 47th most free press in the world. What about the First Amendment to the constitution declaring Freedom of Speech and of a Free press? It’s being completely trashed by the government and public education attempting to rewrite it. American free press now ranks behind Germany, the UK (remember the American Revolution?) Belize, Austria, even The Czech Republic, and El Salvador! With government crackdowns and intrusions, freedom of the press in the United States is on life support. What are YOU going to do about it? Don’t think it applies to you? You’re not doing anything wrong? Well check this, happening-as-we-speak, story out about parents who’s child has literally been taken away from them and their constitutional right of free speech squelched as their world’s greatest fears are being realized. Unfortunately, our “report selective evil” press is ignoring much of this story. Lou and Linda Pelletier took their daughter, Justina, to the Boston Children’s Hospital after she came down with flu-like symptoms. She was being treated for a rare genetic disorder at Tufts by a doctor that they trusted and were happy with, but the BCH doctors disagreed with that prognosis and determined that it was all in her head and that she suffered from somatoform, a psychiatric disease. They decided that Justina’s parents were abusive by over-medicating her needlessly. They immediately declared her a ward of the state and police-escorted the Pelletiers out of the hospital without their daughter.That was one year ago on Valentine’s Day, 2013. The courts issued a gag order to shut anyone up involved with this case under the guise of “patient protection” or HIPPA laws. Out of love for their daughter, and a parent’s desperation to save her, this week Lou Pelletier broke the gag order and went public on the Blaze Radio network and on Megyn Kelly’s show on Fox News to plead for help. “They’re killing my daughter”, Pelletier cried to Glenn Beck, who vowed to cover this tragic story until it was resolved. Results? Lou Pelletier may go to jail for breaking his silence because he is trying to save his daughter. Very curious is the fact that the gag order was not issued until seven months after the case began and shortly after a Massachusetts newspaper got wind of this tragedy and was working on the Justina Pelletier case. The state is trying to intimidate this desperate father, and anyone else who dares to speak. Sound familiar? Anyone read history from the 1930-40’s concerning Nazi Germany? Hello! Anyone home here in America? What about parental rights? The hospital even wanted the Pelletier’s to sign a horrifying document that declared Justina a ward of the state and that as such she would be subject to any experimental tests that they deemed necessary. And by signing, the Pelletiers would not seek a second opinion. Are you kidding me?? What nitwit parent would sign such an atrocity? Of course, they refused. Lou Pelletier explained to Beck and to Kelly that in order to enter their daughter’s hospital room, they were not allowed to carry a cell phone, camera or other listening device. Linda, Justina’s mother, could not enter with any of Justina’s siblings. Inside the room were police carrying guns. Seriously? Does this sound like the “land of the free” to you?? Linda observed red streaks on Justina’s abdomen indicating possible sepsis infection. Shortly before Justina entered BCH, she was ice skating and living the fairly normal life of a teenager. Now her mother has to watch helplessly as her daughter is confined to a wheelchair and suffers a constant decline in health because she’s not being treated for the original genetic disorder diagnosis. BCH doctors say it’s just psychosis”. 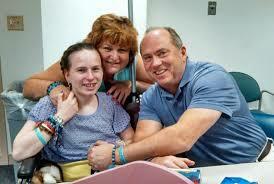 This great hospital that is so concerned about Justina’s well-being has denied her, a devout Christian, any clergy. She’s missed Easter and Christmas as well as Sunday services for over a year. Justina has not engaged in school lessons or tutoring since being held captive at BCH. She’s now 15 years old. Just this week the court moved Justina to foster care. Foster care? So it’s now not at all about medical care, it’s about the state declaring the Pelletiers’ unfit parents. At the judge’s recommendation, Linda Pelletier collapsed to the floor in unbelief. She was rushed to a different hospital for care. Incidentally, how many of you know people who are truly unfit to have children and are horrid parents? A ton! I know them too! Anyone affiliated with this case declare that there is not an iota of evidence that Justina does not come from a caring and loving home. Is there no common sense in determining what makes a good and bad parent? Which one are you? Are you sure? Who would stand up for you? We as Americans need to stand up for parents’ rights before criminals like those at BCH continue this overreach. Free speech is being smothered day after day. Our constitutional rights are hanging by a thread. We are the only ones who can make enough noise to resolve this horrific injustice before it happens to your child or my child. I realize that no one wants to get involved. We just want to live our lives. To go to work, take our kids to ball practice, come home and eat dinner and sleep in peace. Unfortunately, those days are gone. We have a lawless and imperialistic administration, an inept congress and a complicit media that reports agendas, not truth. If you’re a student of history you will no doubt recall the Wiemar Republic and Nazi Germany. Nobody wanted to admit or believe what Hitler or Musolini were doing to the Jews and others that they deemed unfit. They ignored or shut their eyes to the horror. I wish I were being dramatic. What can you do? Help Justina get back to her parents who love her. Call 800-722-9550 to sign a petition to help the Pelletiers or go to www.justiceforjustina.com. Put yourselves in the Pelletier’s shoes. This is your chance to make a difference. Unfortunately, this story is becoming more common. Next week this blog with report a similar story happening in Mesa, Arizona, to a friend of my daughter’s. You won’t believe this one either. Buckle up America.